It is the stretch of sea, already in Liguria, that ends the natural stretch of the coast. Here, the coastal landscape changes, no longer do we see the endless beaches of Versilia, but sheer cliffs that drop straight into sea, as in the nearby Cinque Terre, and the horizon clotted with small islands. The destination of English poets, this corner of the sea owes its name to its most regular visitors: Byron and Shelley, the latter having been shipwrecked off Lerici. 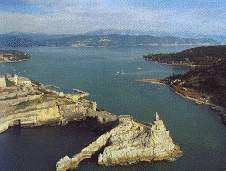 Portovenere, easily reached by boat from Lerici, is a tiny port standing in a natural cove. 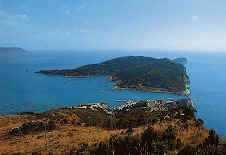 Opposite, Palmaria island, a place that attracts tourist and the curious, renowned for the ruined ancient fortifications of the Malaspina family and for its unusual natural landscape: it is wooded all the way to the summit and surrounded by numerous caves.